1828 Capped Bust Quarter. B-1. Rarity-1. MS-64 (NGC).A handsome piece with wisps of rose and pearl gray toning to a base of warm silver-olive patina. This is an uncommonly well produced coin by early U.S. Mint standards, both sides boldly to sharply defined within uniformly denticulated borders. Both sides are exceptionally smooth in appearance and readily identify this coin as a conditionally rare survivor of this underrated type. 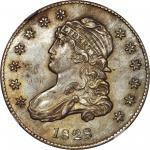 The early (read: pre-1838) quarter series are among the most challenging to collect in all of U.S. numismatics. 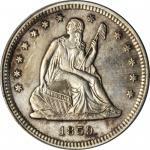 For starters, virtually all issues of the Draped Bust and Capped Bust types were produced in limited numbers, the only year that saw a seven-figure mintage being 1835 when 1,952,000 coins were struck. During the earliest decades of U.S. Mint operations silver coinage was not achieved on government account but, rather, at the request of bullion depositors who ordered specific denominations for their bullion. Since the half dollar was the most popular silver denomination with contemporary bullion dealers, it is little wonder that few quarters were produced. 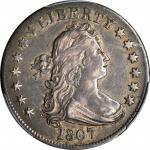 During calendar year 1828, in fact, the Mint delivered just 102,000 examples of this denomination. When we further consider that the virtual lack of contemporary numismatic interest in these coins left the survival of Mint State examples almost entirely to chance, it is little wonder that high quality Capped Bust quarters of any date are elusive in todays market. Of the four known die marriages of the 1828 quarter Browning-1, offered here, accounts for the vast majority of survivors. This variety combines an obverse with repunching to stars 7, 9, 10, 11 and 13 with a reverse on which the letter I in PLURIBUS is centered under the right side of the upright of the second letter T in STATES.